We use the lens of ‘institutional work’ to explore the implementation of innovative projects within the NHS in England, designed to improve access to primary care services. We report a qualitative process evaluation of their implementation. We highlight the conflicting institutional logics at work across the field, and provide some examples of ‘creating’ and ‘disrupting’ institutional work required to bridge them. We explore the enabling conditions which may have allowed our participants to temporarily transgress the institutional constraints within which they worked. We provide evidence which may be of practical use for those seeking to innovate in this way, and ask whether or not these micro-level acts of creation and disruption may, in the longer term, accumulate towards wider institutional change. This study is based on research carried out for a project funded by the National Institute for Health Research Collaboration in Applied Health Research and Care (NIHR CLAHRC), Greater Manchester and by NHS England (Greater Manchester). 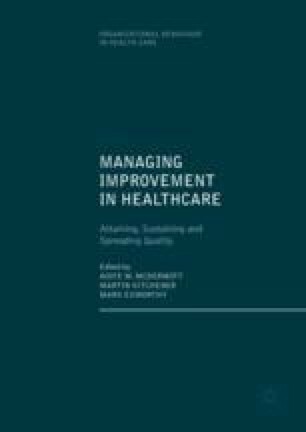 The views expressed in this chapter are those of the authors and not necessarily those of the NHS, the NIHR or the Department of Health. We are grateful to the participants who gave freely of their time, and to the wider project team. Bostock, N. (2015). NHS England reveals £200m ‘vanguard’ areas trialling NHS integration. GP Online. Retrieved from http://www.gponline.com/nhs-england-reveals-200m-vanguard-areas-trialling-nhs-integration/article/1337555. Accessed 30 May 2017.